Vietnam veteran Fred Dietz served in the Army from 1967 to 1969. 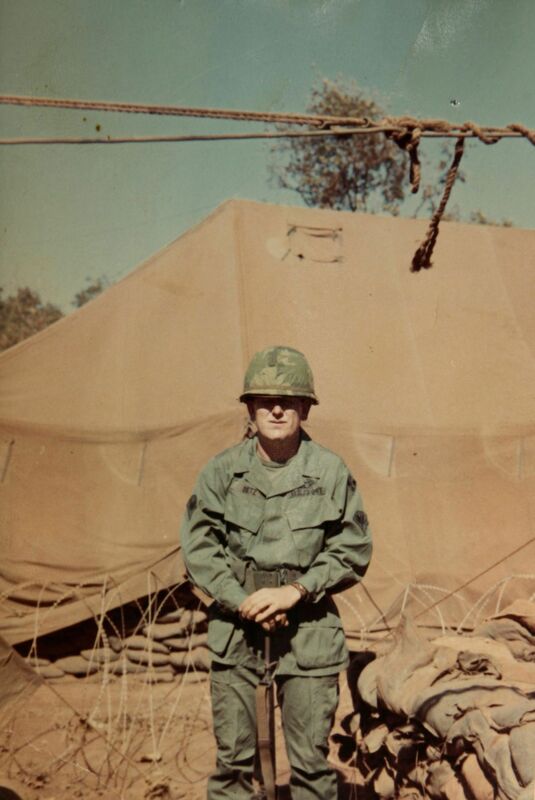 Vietnam veteran Fred Dietz is pictured in Vietnam. He contracted malaria while he was stationed there. Fred Dietz was in the U.S. Army from 1967 to 1969. This is part of his Vietnam story. For the complete interview, please go to billingsgazette.com/Vietnam. Dietz: "My folks were very set on me getting a college degree. I wasn't ... but of course, all of us guys in that age group, we had the draft. We always knew it was behind us. If you got your draft status changed, more than likely, the draft board would catch up to you. I thought I was really slick, partying just having a good time and life was good, but I found out I was pretty naive. You say things to yourself, there are certain quirks you have. Mine has been authority figures. I had a real smart mouth. It was never really challenged. The military does that." Dietz went to basic training in Fort Dix, N.J. At first, Dietz got orders for Germany. After a stint of "painting rocks white" and witnessing two sergeant majors questionably taking goods, he decided to volunteer to go to Vietnam. Gazette: To see two officers do that, and realize that you either sit on the information, or get out has to be rather off-putting. Dietz: "This is all hindsight. But what had happened was that the Army was doing the biggest investigation of (noncommissioned officers) ever for corruption. They don't tell (corporals) like me or put it in Stars and Stripes." Dietz flew into Cam Ranh Bay. Dietz: "Vietnam attacks all your senses. No. 1, the heat. You see things that you've never really seen, like mamasans and papasans. They're scurrying all over the place. The sound of helicopters was unbelievable — because, you know, you don't hear that. Because Vietnam is what it is, a jungle, it's hot, it's humid. The smell is different." Gazette: What did it smell like? Dietz: "Sometimes, I thought it was richer or rotten — I'm not sure. Maybe overripe or something. But it was distinctive enough where if you're in New Jersey, unless you're next to a factory, you don't think of it. But I think with me, my senses were heightened anyway. "... They put us on a (2½-ton truck) and they take us to an old drive-in theater. And we're going, 'What the hell are we going to do here?' We stayed there for two days. ... I can say now that I am older and have more wisdom, but they didn't know what to do with us. The 'TDY' meant they were looking to fill slots all over. Ours just happened to be the Fourth Infantry Division. They were looking to fill holes. They put us out in a drive-in theater — no movie. "... As soon as I got to the field ... the medic, of all people, comes over to all the new guys and the first thing he does is he takes all of our equipment, rucksack, all that. He starts tossing stuff. You're not going to need this, you're not going need that. ... Automatic weapons: You don't have to be a marksman. I got comfortable enough and went out on the field and went out on patrols. I don't know what we're doing to these kids nowadays, but we didn't carry much with us. We carried water, ammo, grenades, either C-rations or (long-range reconnaissance patrol) rations. All you do was add hot water to it. You took a bar of C4 (explosives). You went out on patrol. Once you could get a boonie hat, you didn't wear your helmet. They were just pain and headache and you'd bump up and down. If you had any peripheral vision, they blocked it and you didn't want any block. It was kind of loose. We used the C4, take a little piece of it and make hot water. If you had LRRP rations you put it in there and had a hot meal. "The new guys weren't told when you take a little piece and light it, and the first thing you yell at them is, 'That's too much. Put it out,' and they'd hit it. That's when C4 explodes. We always made sure it was just a little. It scared the s--t out of all of us. "We all had our own tubes of morphine because the medics wanted to make sure we weren't out and there was any shortage of morphine. Then you carried dumb stuff — pop if you had it. Things like that. But, we could move quicker and quieter without a whole lot of stuff. When your range of vision is limited, quicker and quieter is the best. It may not turn out the best, but it's better than the (Army of the Republic of Vietnam). "... The first firefight we got into, I didn't do so great." Gazette: How do you judge yourself in a situation like that? Dietz: "It's like my mind went away. I had no real control. It scared me when it was over. I thought, 'Oh Jesus, you can't do that.' Because the military is hurry and wait, and I had a lot of hurry up and wait, hurry up and wait, I realized you have to wait because the (Viet Cong) were the best at waiting. They could wait like hours. And, if you could wait, you'd be OK, not great, but it wouldn't swoop down on you and startle you. "Suddenly, I realized we were getting into positions where we were setting up the ambushes. We would wait there, and wait there and sooner or later, either the (North Vietnamese Army) or Charlie would come through. It's an ego builder, because then you're more on the offense more than you are on the defense. ... We sort of went through, as I look back on them, "The Gunslinger" stage — not bulletproof, but the quickest on the draw. Gazette: After that first time and you were scared, was it just because you didn't know what to do, or things were happening so fast, what was it? Dietz: "I don't remember what I fired at. I don't remember changing my clip. I had hand grenades, but I didn't use them. It never entered my mind. I had things on me that I could have used, and I didn't. I could have been firing at a clump of bushes in that setting. And, I just emptied two or three clips. At the time, you think, 'This is it. This is right.' Then, it's over. When that's over, you know, smoke ’em if you got ’em. Of course, the medics check to make sure no one's hurt and if they were, they got medevaced out. But, all of a sudden it comes down to almost a calm and it's amazing how many rounds can be fired and nothing hit. ... It startled me." Gazette: Are you fearful in those moments? Dietz: "Yeah, panic. I think you are. I guess you could say it was fear because you're doing something you're not aware of. ... But if you're doing something with an automatic weapon, and you don't know what you're doing. I am not saying you don't realize what you're doing. It's different than when you reach a stage that you do automatically. There's some kind of control or something. This was without control." Dietz was in the Central Highlands, between Bambi Tuit and Pleiku. Dietz: "Pretty country. The only thing we found out is that at night, it got cold. ... That was a different surprise. Not only did we have to work with the (Army of the Republic of Vietnam), I have heard a lot of guys praise them, but I think they're a bunch of horses asses, but anyway. The ones we were working with weren't worth a s--t. We were working with Montagnards. They're amazing people. They are. If you're fair with them, they're fair with you. If you screw with them, they don't care if you're American, North Vietnamese, South Vietnamese, Chinese — they're coming at you. But they made no bones about it. Kind of primitive. Special Forces worked with them the most. Tough. "And when we all got bracelets from them brass rods that they made bracelets. They cut grooves in them. We all had to have those. That's the other thing: Infantry guys — we were all wearing jewelry. If you got any gold jewelry, it was 24-karat. You didn't want to get jewelry that you'd leave in a duffel bag or somewhere else, so you wore it. I never thought about it. You didn't wear so much that you clinked, but everybody had Montagnard bracelets — at least two necklaces, gold ones." "... We got about a month in; we had been working short-range (reconnaissance) which is OK because you move around, set up ambushes, listen — so you're always aware that the enemy is somewhere in the area. ... When we got far enough out, it was NVA. The biggest firebase near Pleiku, if we went in there to guard radar. ... it would be the Viet Cong. The Viet Cong were good. The NVA were a little scary." Dietz: "They were fighting for about 20 years. ... If the Vietnamese had any artillery or heavy equipment, it would be NVA. That could throw you off, and the biggest thing is coming at you is a mortar, and then all of a sudden a tank round comes in, what the hell is this?" Gazette: So you're on this short-range patrol? Dietz: "Again, I go back to it's comfortable because we're winning and we're on the offense. About a day after those (patrols), we were airlifted out. On my last short-range patrol, I was coming down with something, and I didn't know what it was. Being sick like that, intestinally, in the middle of Vietnam is not pleasant. I didn't think too much about it. "... Our sister unit was getting the s--t kicked out of them, so they airlifted us into help. I am all set to get to the (landing zone). It's just ready to hit the ground and I fall out. But, I couldn't get up and the medics checked me and they found out I had a fever. What it was — malaria. "Sometimes we got our pills, sometimes we didn't. The culture was that at the time, the guys were trying to get it. ... It was intentional just to get out of the field. That was the whole part of the social thing — if you could get out of the field for two days, two weeks, a month, you did it. I mean we had one guy in our company who shot himself in the foot. That takes balls, I don't care what anyone says. Even if you got hit by a scorpion, you'd get at least two days out of the field. When a scorpion hits you, you drop to your knees. I thought they'd got shot. "... Two medics kept me with them all night. They were giving me aspirin the whole time. ... The next morning, they evaced me into the Pleiku Evac hospital. ... When we got to the evac hospital, they would take your temperature the minute you got off the chopper. I saw some guys, four or five guys, would throw them in the field tubs — bathtubs filled with ice — that's because they had a temperature of 105 or over. They had to drop that immediately. I didn't get thrown in one. I found out it was because those medics had given me aspirin. When I got there, my temperature was 104, so I just went in. I don't know how to call it — not delirious, but I wouldn't let go of my weapon."